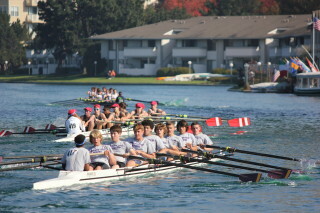 Two of the best rowing events in Northern California are held near Foster City each November. The Head of The Lagoon Foster City Regatta (also known as hotLFC), Sat-Sun, 11/10/18-11/11/18, at the central Foster City Lagoon. The BAIC Corkscrew Regatta, Sunday 12/2/18 around the Bair Island Corkscrew Slough just south of Foster City. It is organized by the Bair Island Aquatic Center (BAIC). Crews competing at a hotLFC event! While rowers will greatly enjoy both, for spectators the Head of The Lagoon Regatta at Foster City Lagoon is the better venue. Freeway access is easy and parking is more readily available. Spectators can see more of the race and easily get to the contestants and walk among them. Serious rowing enthusiasts will also enjoy the smaller more informal Corkscrew Regatta event. The Bair Island Fall Regatta has been cancelled for 2016. Saturday Date: 11/10/18, 9 am-12:35 pm. Collegiate and Open racing only on Saturday. The number of entries each day will be limited to a 250 boat maximum. See detailed schedule. Sunday Date: 11/11/18, 9 am-1:00 pm. Junior and Masters racing with some Open crews as well. See detailed schedule. Location: The beautiful Foster City Central Lagoon. Most of the contestants with their shells will be found getting ready on the lawns on either side of the Foster City Recreation Center. Parking: Free spectator parking is available a block away at 1065 E. Hillsdale Blvd, Foster City (BofA/Century Plaza Bldg). See more about parking here. Course: This is a 5-km timed trial competition (called a head race). The gently curving course is protected from wind and has no currents so perfect conditions are expected. See course map. There are plenty of places all along the long course to watch the races and to picnic. Competitors: The number of entries will be limited to a 250 boat maximum each day. Collegiate and Open crews compete on Saturday and a few Open crews on Sunday as well. Juniors and Masters may only compete in Sunday’s races (i.e., not in Saturday’s races). Sanctioned: Sanctioned by USRowing, the organization which selects the US Olympic teams. Description: This 15 km time-trial race covers a long, beautiful and challenging marine obstacle course with twisty 17 turns. It is a smaller, less formal race which attracts about 100 enthusiastic rowers. Date: Sunday, 12/2/18, races start at 8:30 am. Spectators: Much of the race is out of sight (see entire map) but the best place to watch the finish is from Stanford’s boathouse at 300 Cardinal Way, Redwood City or the boardwalk and parking lot just to the west of it. The race will be action packed two hours since the racing shells start and finish close together. Good viewing is available from the docks, shoreline, and from Stanford’s balcony. Bring binoculars and a good hat. Show up around the 10:15 am starting time to watch the festivities. More Details: Before you go confirm latest details here. Fall Regatta Course (2007). Will probably be similar this year. Click the map above to expand it. Sunday Date: 11/15/15, 8:30 am- 3 pm. See more info. It appears that this Fall Regatta last run in 2015 is being replaced by the Corkscrew Regatta described above. Location: The Parkside Aquatic Park is the center of activity. 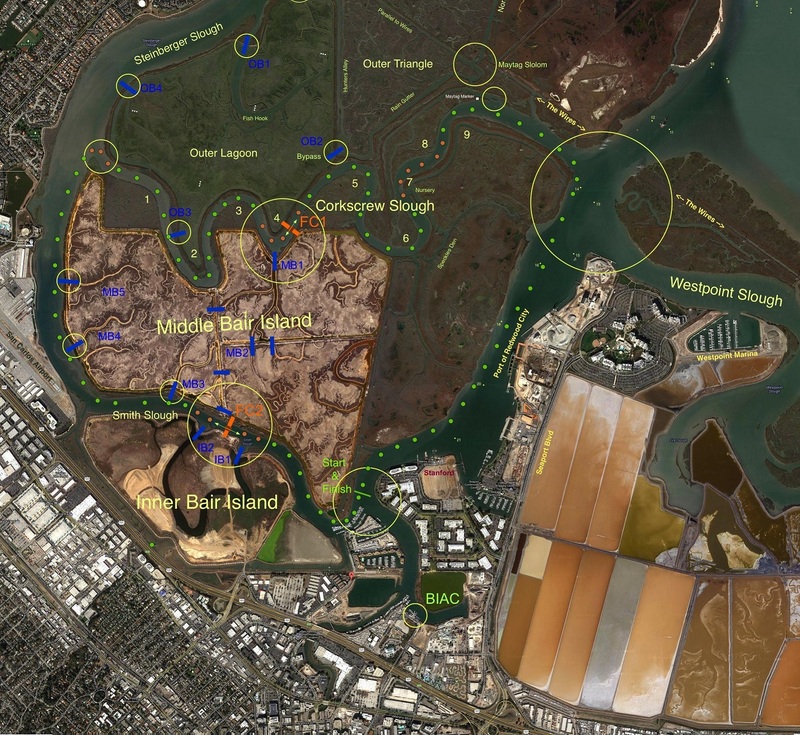 It provides competitors access to the San Mateo Marina Lagoon, which borders Foster City on the west parallel to Highway 101, where the races will be run. Parking & Directions: There is NO parking in Parkside Aquatic Park for anything except boat trailers. On-street parking is also very limited. Volunteers will direct visitors to a few more lots but expect challenges with parking. Also consider watching from the Foster City side of the Marina Lagoon. Check the Regatta Course map above and Google Maps for ways to get Levee Pedway, Harbortown Pedway and other sidewalks paralleling the Marina lagoon. Course: This is a 5-km timed trial competition (called a head race). The course is one of the most crooked around, changing directions 90 degrees or more 10 times from beginning to end, which makes for a good rowing challenge. Competitors: There are usually about 600 men and women from ages 15 to 70 competing in 170 boats in 65 races. Sponsors: The Bair Island Aquatic Center. This is race marks the end of the USRowing fall racing season in California. Website and more Race Details.